本发明提供了一种水基涂料体系，其可用于在多种多样的基材上形成耐久的、耐磨的、坚韧的、保护性涂层。 The present invention provides a water-based coating systems, which can be used to form a durable, wear-resistant, tough, protective coating on a variety of substrates. 这种涂料体系有利地具有优异的粘附性质并且可以直接涂布在不锈钢表面上，而无需中间底漆层。 This coating system is advantageously excellent adhesion properties and can be directly coated on the stainless steel surface, without intermediate primer layer. 然而，如果需要，底漆层或其他类型的涂层可以与本发明的涂料体系组合使用。 However, if desired, a primer layer coating or other type of coating system may be used in combination with the present invention. 这种涂料体系对于保护含金属的基材，诸如联运的冷藏货物集装箱，特别有效。 This coating system for the protection of substrate containing metal, such as transport of refrigerated cargo containers, particularly effective. 所得涂层是柔性的并且耐冲击。 The resulting coatings are flexible and impact resistant. 因为该涂料组合物是水基的，所以它比溶剂基组合物具有更低的VOC排放和更少的残留气味。 Since the coating composition is water-based, so it has less residual odor and VOC emissions of less than solvent based compositions. 本申请要求于2010年10月20日递交的美国临时申请序列号61/394,992的优先权。  This application claims priority to US Provisional Application Serial No. 61 / 394,992 in October 20, 2010 submitted. 本发明涉及用于在多种基材上、特别是在含金属的基材上形成保护涂层的水基涂料体系。  The present invention relates to a variety of substrates, especially forming a protective coating of water-based coating system on a metal-containing substrate. 更具体地，本发明涉及含有水基顶涂层组合物的涂料体系，所述水基顶涂层组合物不仅对包括铁素体不锈钢在内的宽范围的基材具有改善的粘附特性，而且其涂覆特性允许这些水基组合物提供具有明显减小缺陷的涂层。 More particularly, the present invention relates to water-based coating system comprising a topcoat composition, the water-based top coat composition not only has improved adhesion characteristics of the substrate include a wide range of ferritic stainless steel including, Further characteristics which allow these water-based coating compositions provide coatings having significantly reduced defects. 联运货物集装箱（也被称为货运或航运集装箱）是用于在两个区域(包括两个国家)之间搬运产品和原料的可重复使用的运输和贮存单元。  intermodal cargo containers (also referred to as shipping or cargo containers) for the two regions (including two countries) transport and storage unit handling reusable products and raw materials between. 联运货物集装箱被标准化以便联合运输，诸如海上运输、货运火车运输和货运卡车运输之间的联合运输。 Intermodal cargo containers are standardized so that combined transport, combined transport between sea transport, freight trains and freight transport such as trucking. 货物集装箱的标准化也被称为集装箱化。 Standardized cargo containers also known as containerization. 集装箱化为全球商业提供了许多益处。  container into a global business offers many benefits. 装运货物(shipped goods)搬运会更容易、 更廉价。 Shipment (shipped goods) transport will be easier and cheaper. 制造商知晓在一个地点装载的货物可以在目的地被容易地卸载。 Manufacturers know the goods loaded in a location that can be easily unloaded at destination. 因为集装箱通常被密封并且可以上锁以防止篡改和盗窃，所以已经改善了货物的安全性。 Because the container is usually sealed and can be locked to prevent tampering and theft, it has improved the safety of the goods. 集装箱还具有更长的使用寿命，并且已用集装箱具有更大的市场。 Containers also have a longer service life, and already has a larger market in containers. 此外，制造商由于知道世界各地都有潜在客户而可以更大量地制造货物集装箱，所以其本身的成本降低了。 In addition, because the manufacturers know all over the world and potential customers can more mass-produced cargo containers, so reducing the cost of its own. 业已创立了若干国际标准以促进国际集装箱化。  It has been the creation of a number of international standards to facilitate international containerization. 例如，国际标准化组织（ISO)已经颁布了可适用的标准，包括定义术语、尺寸和等级的R-668;定义标识记号的R-790;推荐柜角配件的1?-1161;设定通用集装箱的尺寸的1?-1897。 For example, the International Organization for Standardization (ISO) has promulgated standards applicable, including definition of the term, the size and level of R-668; defined identification mark of R-790;? Recommended cabinet corner fitting 1-1161; set universal container size 1? -1897. 其他标准包括43了105728-00 ;130 9879(1997)；IS0 14829(2002)；ISO 17363(2007)；ISO/PAS 17712(2006)；ISO 18185 (2007);和IS0/TS 10891(2009)。 Other criteria include a 43 105728-00; 130 9879 (1997); IS0 14829 (2002); ISO 17363 (2007); ISO / PAS 17712 (2006); ISO 18185 (2007); and IS0 / TS 10891 (2009). IICL(Institute of International Container Lessors (国际集装箱出租商协会））规定了对于涂料/漆料性能的国际规范。 IICL (Institute of International Container Lessors (International Container Lessors)) provides for international norms for coating / paint performance. 还请参见国际标准化组织（ISO) ,Freight Container(货运集装箱），ISO Standards Handbook，第4版，2006, ISBN 92-67-10426-8的第34卷；以及Levinson，Marc，The Box:How the Shipping Container Made the World Smaller and the World Economy Bigger,Princeton,NJ,Princeton University Press，2006，ISBN 0691123241。 Please also refer to the International Organization for Standardization (ISO), Freight Container (shipping containers), ISO Standards Handbook, 4th Edition, 2006, ISBN 92-67-10426-8, Vol. 34; and Levinson, Marc, The Box: How the Shipping Container Made the World Smaller and the World Economy Bigger, Princeton, NJ, Princeton University Press, 2006, ISBN 0691123241. 这些标准和出版物都被全文加入本文中，用于各种目的。 These standards and publications are hereby incorporated herein in, for a variety of purposes. 货物集装箱在它们的使用寿命期间经历严苛的腐蚀性环境。  cargo container harsh corrosive environment experienced during their service life. 当在海上运输时，集装箱暴露于盐水的腐蚀作用。 When transported by sea, the container is exposed to the corrosive effects of salt water. 当暴露于自然环境时，集装箱必须经受风、日光、冰雹、雨水、 沙尘、热量等。 When exposed to the natural environment, containers must withstand wind, sun, hail, rain, dust, heat and so on. 暴露于日光的集装箱可能被烘烤至82°C(180°F)或甚至更高的温度。 Exposure to sunlight may be baked in the container to 82 ° C (180 ° F) or even higher temperatures. 因此，货物集装箱必须被制造成允许该集装箱在合理的使用寿命时长内经受得住这样的暴露。  Thus, cargo containers must be made to allow the container to survive such exposure reasonably long life. 作为一种策略，集装箱可由耐腐蚀材料诸如不锈钢、耐候钢(C0R-TEN牌钢或CORTEN牌钢）制成。 As a strategy, the container may be made of corrosion resistant materials such as stainless steel, made of weathering steel (C0R-TEN steel plate or steel plate CORTEN). 例如，冷藏货物集装箱是一类在联运货运运输中使用的联运货物集装箱，其用于温度敏感货物的冷藏运输。 For example, a class of refrigerated cargo containers are used in intermodal freight transport cargo transport container for refrigerated transport temperature sensitive cargo. 典型的冷藏货物集装箱包括钢框架和焊接到该框架上的钢壁面面板。 A typical refrigerated cargo container comprising a steel frame and steel wall is welded to the panel frame. 在一个实施方式中，冷藏货物集装箱的框架由耐候钢制成，而壁面面板由不锈钢诸如铁素体不锈钢制成。 In one embodiment, the frame is made of a refrigerated cargo container weathering steel, and stainless steel wall panel such as a ferritic stainless steel. 通常诸如通过电镀框架或用含Zn底漆涂布框架来保护该框架免受腐蚀。 Typically such a frame or plating from corrosion primer containing Zn is applied to protect the frame by a frame. 然后，采用防水阻隔进一步保护该框架。 Then, to further protect the waterproof barrier frame. 通常，双组份环氧涂料用于涂布该框架。 Typically, two component epoxy coatings used to coat the frame. 然后，环氧涂料在上涂布顶涂层，因为未经涂布的环氧往往在日光下降解。 Then, the coating on the coated epoxy topcoat because uncoated epoxy solution tends to decrease in daylight. 不锈钢壁面面板足够耐腐蚀，因而严格来说不必将保护涂层涂覆到不锈钢上。 Stainless steel wall panel sufficient corrosion resistance, and thus need not be strictly applied to the stainless steel protective coating. 然而通常仍希望在不锈钢上涂覆涂层，以提供装饰、商标标记、条形码信息和其他标记。 However, often still desirable coating layer coated on the stainless steel, to provide a decorative, trademark tag, barcode information and other indicia. 历史上，主要是溶剂基涂料体系被用于保护货物集装箱，因为许多被提出的水基体系不能满足适用的性能要求和/或标准。  Historically, solvent-based coating systems are mainly used to protect cargo containers, because many of the proposed water-based systems can not meet applicable performance requirements and / or standards. 非常难以配制当被直接涂覆到不锈钢上时表现出可接受粘附性的水基涂料体系。 When very difficult to formulate an acceptable adhesive is applied directly to water-based coating systems exhibits a stainless steel on. 水基涂料往往还具有更大的关于下垂、流平、缩孔和开裂的问题。 Water-based paints also tend to have greater regard to sagging, leveling, shrinkage and cracking problems. 因此，只有溶剂基涂料体系已经在行业中得到了广泛的商业接受度。 Therefore, only solvent-based coating systems have been widespread commercial acceptance in the industry. 集装箱行业对使用水基涂料体系持有很强的偏见。 The container industry to use water-based coating systems hold strong prejudices. 随着环境意识的增加，非常希望开发改进的技术，从而允许使用水基涂料体系来保护货物集装箱或其他基材。  With increasing environmental awareness, highly desirable to develop improved technology, allowing the use of water-based coating systems to protect cargo containers or other substrates. 本行业强烈需要特别是当被用于涂布不锈钢基材时能够满足联运货物集装箱行业的严苛要求的可商业化水基涂料体系。 A strong need in the industry especially when it is used for coating the stainless steel substrate may be able to meet the water-based coating systems commercially intermodal cargo container industry stringent requirements. 本发明提供了一种水基涂料体系，其可用于在多种多样的基材上形成耐久的、耐磨的、坚韧的、保护性涂层。  The present invention provides a water-based coating systems, which can be used to form a durable, wear-resistant, tough, protective coating on a variety of substrates. 这种涂料体系优选具有优异的粘附性质并且可以直接涂布在不锈钢表面上，而无需中间底漆层。 Such preferred coating system having excellent adhesion properties and can be directly coated on the stainless steel surface, without intermediate primer layer. 然而，如果需要，底漆层或其他类型的涂层可以与本发明的涂料体系组合使用。 However, if desired, a primer layer coating or other type of coating system may be used in combination with the present invention. 这种涂料体系对于保护含金属的基材，诸如联运的冷藏货物集装箱， 特别有效。 This coating system for the protection of substrate containing metal, such as transport of refrigerated cargo containers, particularly effective. 所得涂层是柔性的并且耐冲击。 The resulting coatings are flexible and impact resistant. 因为该涂料组合物是水基的，所以它比溶剂基组合物具有更低的VOC排放和更少的残留气味。 Since the coating composition is water-based, so it has less residual odor and VOC emissions of less than solvent based compositions. 本发明的涂料体系通常包含水性涂料组合物，其可用于在各种各样的基材上形成耐久的、耐磨的、坚韧的顶涂层。  The coating system of the present invention generally comprise an aqueous coating composition which can be used to form a durable, wear-resistant, tough topcoat on a variety of substrates. 值得注意地，水性涂料组合物不仅对于下面的底漆涂层(诸如掺有环氧树脂等的那些）、而且对于未经涂布的不锈钢(诸如裸露不锈钢)提供了具有增强相容性的水基顶涂层。 Notably, only the aqueous coating composition, the following primer coatings (such as those doped with an epoxy resin or the like), but also for uncoated steel (such as stainless steel, bare) provides enhanced compatibility with water based top coat. 当这些水性涂料组合物直接涂覆到不锈钢(诸如铁素体不锈钢)表面上时，所得顶涂层显示优异的耐起泡性、很少剥离、非常耐久并且优异的粘附性。 When these aqueous coating composition is applied directly onto a stainless steel (such as ferritic stainless steel) when the upper surface of the resultant top coat exhibits excellent blister resistance, little peeling, very durable and excellent in adhesion. 这使得该组合物非常适用于直接涂布联运货物集装箱的不锈钢表面。 This makes the compositions very suitable for intermodal cargo container directly coated stainless steel surface. 该组合物特别适于用在冷藏货物集装箱上，这种集装箱通常包含多个种类的待涂表面。 The composition is particularly suitable for use in refrigerated cargo containers, such containers typically comprise a plurality of types of surface to be coated. 这些表面包括不锈钢。 These surfaces include stainless steel. 本发明的优点由含有树脂组分的水性涂料组合物提供，所述树脂组分包括一种或多种成膜树脂。  The advantage of the invention is provided by the aqueous coating composition containing a resin component, said resin component comprises one or more film forming resins. 合乎需要地，该成膜树脂要么独自成膜，要么诸如如果该树脂与聚结助剂、 加热等等组合使用则导致成膜。 Desirably, the film forming film-forming resin either alone, or if the resin such as coalescing aids, heat and the like is used in combination results in deposition. 该树脂与一种或多种非粘结剂颜料组合使用，这些非粘结剂颜料累计以如下进一步描述的显著量存在。 The resin composition of one or more pigments with non-adhesive use, these non-binders pigment accumulated significant amounts present as described further below. 颜料含量有助于提供改善的粘附性以及改善的涂覆特性。 Pigment content helps to provide improved adhesion and improved coating properties. 这些颜料在涂料中还起到其他作用。 These pigments in the paint also serve other purposes. 作为例子，填料可以作为增稠剂。 By way of example, fillers may be used as a thickener. 参照以下本发明的各实施方式的说明并结合附图，本发明的上述以及其他优点以及达成这些优点的方式变得更明显，而且发明本身将被更好地理解。 Description of the embodiments  reference to the following drawings taken in conjunction with the present invention, the above and other advantages and the way to achieve the advantages of the present invention will become more apparent and the invention itself will be better understood. 图1是用在联运货运运输中的冷藏货物集装箱的透视图，其示出了该集装箱的包含出入门(access door)的一端。  FIG. 1 is a perspective view of a refrigerated cargo container used in intermodal freight transport, which shows one end of the container comprises an entry (access door) is. 图2是图1的集装箱的另一透视图，其示出了该集装箱的包含冷藏构件的一端。  FIG. 2 is another perspective view of the container of FIG. 1, which illustrates a refrigerator comprising an end member of the container. 如下描述的本发明的实施方式并非意欲穷举，或将本发明限制为如下详细描述中所公开的精确形式。  The following embodiments of the invention described herein are not intended to be exhaustive or to limit the invention to the precise forms disclosed in the following detailed description of. 更确切地说，选择并描述这些实施方式是为了本领域其他技术人员可以认识并理解本发明的原理和实施。 Rather, these embodiments were chosen and described in order to others skilled in the art may recognize and understand the principles and embodiments of the present invention. 本文所引用的所有专利、在审的专利申请、公开的专利申请和技术文章通过引用分别全文插入本文，用于所有目的。 All patents cited herein, pending patent applications, published patent applications, and technical articles are inserted entirety herein by reference for all purposes. 本发明的水性涂料组合物可以是单相溶液，其中至少包括树脂组分的一种或多种成分基本上完全溶解在水性载剂中。  The aqueous coating composition of the present invention may be a single phase solution comprising at least one or more ingredients of the resin components substantially completely dissolved in an aqueous carrier. 或者，所述涂料组合物可以包含两相或更多相。 Alternatively, the coating composition may comprise two or more phases. 含有两相或更多相的组合物可以是分散体形式，诸如其中的一相或多相分散在另一材料和/或另一相的连续相中的分散体。 Containing two or more phases of the compositions may be in the form of a dispersion, such as where one or more phases dispersed in another material, and / or another phase of the dispersion in the continuous phase. 一些分散体是悬浮体形式，包括但不限于胶体状悬浮体。 Some dispersions are suspensions forms, including but not limited to, colloidal suspensions. 在一些实施方式中，涂料组合物是其中包含有分散在水性载剂中的聚合物微粒的胶乳或乳液形式。 In some embodiments, wherein the coating composition is a latex or emulsion comprising a polymer dispersed in an aqueous carrier microparticles. 当在本文中使用时，"胶乳"聚合物意指，聚合物在至少一种乳化剂(例如表面活性剂）的协助下与水性载剂混合，从而形成在这种载剂中的聚合物颗粒的乳液。 As used herein, "latex" is meant a polymer, mixing the polymer with an aqueous vehicle with the help of at least one emulsifier (e.g. surfactant), thereby forming polymer particles in which the carrier the emulsion. 一些组合物可以是水稀释性的，这意味着，该组合物如果用额外量的水稀释的话保持稳定。 Some compositions may be dilutive of water, which means that, if the composition is diluted with an additional amount of water, then remain stable. 对于水稀释性组合物，一些实施方式使用至少一种能够在不需要使用单独表面活性剂的情况下就分散在水中的聚合物，但是如果需要可以使用单独的表面活性剂。 For the water-reducible composition, some embodiments in which at least one polymer can be used alone without the need of surfactants on dispersed in water, but if desired may be used alone surfactant. 在不需要单独表面活性剂的情况下就可以分散在水中的聚合物通常包含悬挂的离子官能团和/或亲水性链段，它们使得该聚合物的相应区域与水更相容。 Polymer without the need of a separate surface active agent can be dispersed in water typically containing pendant ionic functional groups and / or hydrophilic segments, such that their respective regions of the polymer is more water compatible. 为了阴离子稳定可能需要外来的酸类或碱类，但是这样的酸类和碱类通常与用于分散胶乳聚合物的乳化剂(例如表面活性剂)不同。 In order to stabilize the anion may require external acids or bases, but such acids and bases normally used to disperse the latex polymer emulsifier (e.g. surfactant) are different. 可用在树脂组分中的树脂可以是热固性的和/或热塑性的。  The resin usable in the resin component may be a thermosetting and / or thermoplastic. 便利地，这些中的一种或多种是热塑性的。 Conveniently, one or more of these thermoplastic. 此外，可用在本发明实施中的热塑性树脂的一些实施方式可以是无定形的、结晶的或半结晶的。 Further, the thermoplastic resin can be used in the embodiment of the present invention in some embodiments may be amorphous, crystalline or semicrystalline. 用于树脂组分的示例性树脂包括非环状的、环状的、支化的、线性的、脂族的或芳族的树脂。 Exemplary resins for the resin component include acyclic, cyclic, branched, linear, aromatic or aliphatic aromatic resins. 热塑性树脂优选具有低于约50°C、优选低于约30°C、更优选低于约20°C的最低成膜温度(MFFT)。 The thermoplastic resin preferably has less than about 50 ° C, preferably less than about 30 ° C, more preferably less than about a minimum film forming temperature of 20 ° C (MFFT). 还希望，这种树脂优选具有高于约-50°C、优选高于约-25 °C、更优选高于约(TC的最低成膜温度。 Also desirable, such resins preferably above about -50 ° C, preferably above about -25 ° C, more preferably greater than about a minimum film forming temperature (TC's. -种或多种树脂的分子量可各自独立地在宽范围内变化，其优选通过乳液聚合得到。  - the molecular weight of one or more resins may each independently be varied within a wide range, which is preferably obtained by emulsion polymerization. 数均分子量优选在约5000至100,000的范围内，更优选在约10,000至75,000的范围内。 Number average molecular weight in the range of about 5000 to 100,000, more preferably in the range of about 10,000 to 75,000. 重均分子量优选在约10，〇〇〇至200,000的范围内，更优选在约20,000至125,000的范围内。 Weight average molecular weight of about 10, the range 〇〇〇 to 200,000, more preferably in the range of about 20,000 to 125,000. 除非另有声明，本文使用的分子量是指数均分子量(Mn)。 Unless otherwise stated, as used herein, molecular weight number average molecular weight (Mn). 树脂组分在水性涂料组合物中的量可以在宽范围内选择。  The amount of the resin component in the aqueous coating composition may be selected within a wide range. 一般而言，如果树脂组分的量过低，那么可能难以成膜，更难以形成对基材具有足够粘附性的膜，该膜可能具有不足的耐腐蚀性或其他性能，等等。 Generally, if the amount of the resin component is too low, it may be difficult deposition, even more difficult to form a film having sufficient adhesion to the substrate, the film may have insufficient corrosion resistance and other properties, and the like. 如果使用过高的量，那么可能更难以配制颜料填充体系或者更难以制成可以涂覆到基材上的材料。 If the amount is too high, it may be more difficult to formulate a pigment or filler system is made more difficult to be applied to a substrate material. 权衡利弊，第一水性涂料组合物优选包含，基于水性涂料组合物的总重，约10至80重量％、更优选约15至50重量％、最优选约20至40重量％的所述第一树脂组分。 On balance, the first aqueous coating composition preferably comprises, based on the total weight of the aqueous coating composition, from about 10 to 80 wt%, more preferably from about 15 to 50 wt%, the about 20 to 40 weight percent and most preferably a first resin component. 在一些优选的实施方式中，树脂组分包含至少一种具有酸官能度(或其盐或其酯） 的树脂。  In some preferred embodiments, the resin component comprises a resin having at least one acid functionality (or a salt or ester). 树脂的酸官能度(如果存在的话)可以直接悬挂在聚合物骨架上，或者可以通过适当的链接基团连接到骨架上。 Acid functionality of the resin (if present) can be hung directly on the polymer backbone, or may be connected to the backbone through a suitable linking group. 适当酸官能度的实例包括羧酸、磺酸、磷酸、这些的组合等等。 Examples of suitable acid functionality include carboxylic acids, sulfonic acids, phosphoric acid, combinations of these, and the like. 各种各样的反离子可以用在其中以盐形式提供酸基团的那些实施方式中。 Various counterions may be used in those embodiments wherein providing the acid group in salt form. 这样的阳离子的实例包括，他+、1^ +、冊4+、1(+、这些的组合等等。在优选的实施方式中，酸官能度包括-(：(0) 0NH4+。有利地，当包含这些片段的涂料组合物干燥时，干燥的涂层释放氨，从而在干燥的涂层中留下-C(O)OH官能度。 Examples of such cations include He +, + ^, books + 1 (+, 14 combinations of these, etc. In a preferred embodiment, the acid functionality comprises -.. (:( 0) 0NH4 + Advantageously, when the coating composition contains these fragments drying, the dried coated release of ammonia, thereby leaving -C (O) OH functionality in the dried coating. 用于形成酸官能树脂的反应物优选包括具有可自由基聚合官能度的单体、低聚物和/或树脂。  The resin for forming the acid functional reactants preferably include monomers, oligomers, and / or free-radically polymerizable resin functionality. 可自由基聚合官能度的代表性实例包括（甲基)丙烯酸酯基团、烯烃碳碳双键、 烯丙基氧基团、α-甲基苯乙烯基团、（甲基)丙烯酰胺基团、氰酸酯基团、（甲基)丙烯腈基团、 乙烯基醚基团、这些的组合等等。 Representative examples of free radically polymerizable functionality include (meth) acrylate groups, olefinic carbon-carbon double bonds, allyloxy groups, alpha] -methyl styrene groups, (meth) acrylamide groups , isocyanate groups, (meth) acrylonitrile group, vinyl ether groups, combinations of these, and the like. 当在本文中使用时，术语"(甲基)丙烯酰基"包含丙烯酰基和/或甲基丙烯酰基，除非另有声明。 As used herein, the term "(meth) acryloyl group" including acryloyl and / or methacryloyl group, unless otherwise stated. 可自由基聚合官能度便利地通过如下反应:通常在协助促进所需反应的试剂(例如引发剂等)的存在下，将反应物暴露于适当的固化能量源。  The free radically polymerizable functionality conveniently by the following reaction: typically in presence of an agent to help promote the desired reaction (e.g., initiator) and the reaction was exposed to a suitable source of curing energy. 用于实现可固化官能度的聚合和/或交联的能量源可以是光化性的（例如具有光谱的紫外或可见区域中的波长的辐射）、 加速粒子(例如电子束辐射）、热源(例如加热或红外辐射），等等。 For achieving curable functionality polymerization and / or crosslinking of the energy source may be (e.g. radiation having a wavelength of ultraviolet or visible region of the spectrum having a) actinic light, accelerated particles (e.g. electron beam radiation), heat ( For example, heat or infrared radiation), and the like. 除了酸官能度和可自由基聚合官能度以外，用于制备树脂的反应物另外可以被额外种类的官能度取代或未被取代。  In addition to acid functionality and free radically polymerizable functionality except that the reaction used to prepare the resin may be further substituted or unsubstituted additional types of functionality. 这样的官能度可选用于交联。 Such optional functionality for crosslinking. 作为附加选项，这样的官能度可用于为树脂提供整体分散官能度。 As an additional option, such functionality may be used to provide the overall functionality of the resin dispersion. 一些取代基可以是环结构的共环成员（co-member)。 Some substituents may be co-members of a ring structure ring (co-member). 其他取代基的实例包括羟基、巯基、氨基、酰胺基、异氰酸酯基、氰基、羧酸基、硫酸酯基、亚硫酸酯基、脂肪酸基、环氧基、和这些基团的组合。 Other examples of substituents include a hydroxyl group, amino group, isocyanate group, a cyano group, a carboxylic acid group, sulfate group, sulfite group, an epoxy group, a mercapto group, and a combination of fatty acid amide group, these. 这样的共聚单体的实例包括（甲基)丙烯酸缩水甘油酯和丙烯酸缩水甘油酯、（甲基）丙烯酸甲基氨基乙酯和丙烯酸甲基氨基乙酯、 (甲基)丙烯酸、（甲基)丙烯酸叔丁基氨基乙酯和丙烯酸叔丁基氨基乙酯、（甲基)丙烯酰胺、 4_戊胍胺(4-pentanoguanamine)、羟基烷基酯诸如（甲基）丙烯酸羟丙酯、（甲基）丙烯酸羟乙酯和丙烯酸羟乙酯，（甲基)丙烯腈，N-烷氧基烷基酰胺诸如甲氧基甲基（甲基）丙烯酰胺和丁氧基_(甲基)丙烯酰胺、羟烷基酰胺，诸如N-羟甲基（甲基)丙烯酰胺和N-羟甲基丙烯酰胺、二羧酸诸如马来酸、这些的相应酸酐(如果有的话）；这些的组合等等。 Examples of such comonomers include (meth) acrylate, glycidyl acrylate, glycidyl (meth) acrylate, methyl acrylate and dimethylaminoethyl acrylate, diethylaminoethyl (meth) acrylate, (meth) acrylate, t-butylaminoethyl methacrylate and t-butylaminoethyl acrylate, ethyl (meth) acrylamide, pentyl guanamine 4_ (4-pentanoguanamine), hydroxyalkyl (meth) acrylate, such as (A yl) acrylate and hydroxyethyl acrylate, (meth) acrylonitrile, N- alkoxyalkyl amides such as methoxymethyl (meth) acrylamide and _ butoxy (meth) acrylamide , hydroxyalkyl amides, such as N- methylol (meth) acrylamide, and N- methylol acrylamide, dicarboxylic acids such as maleic acid, the corresponding anhydride (if any); combinations of these, etc. Wait. 酸官能树脂理想地是由如下可共聚反应物衍生得到的共聚物，所述反应物包括(a)至少一种含有悬挂的可自由基聚合官能度的芳族反应物；（b)至少一种具有悬挂的酸官能度(或其盐或其酯）的可自由基聚合反应物;和(c)至少一种具有可自由基聚合官能度的其他可共聚脂族反应物。  The acid-functional resin is desirably as follows copolymerizable derived reactants, the reactants comprising (a) at least one hang-containing reactant may be an aromatic radical polymerizable functionality; (b) at least one acid functionality (or salt or ester) suspended radical polymerizable reactants; and (c) at least one other aliphatic copolyesters reactant free radically polymerizable functionality. 反应物(a)的实例包括苯乙烯、α-甲基苯乙烯、叔丁基苯乙烯、1，3_二异丙烯基苯、 2,4,6-三甲基苯乙烯、2,4-二甲基苯乙烯、2,4-二苯基-4-甲基-1-戊烯、2,5-二甲基苯乙稀、2-乙烯基蔡、3-甲基苯乙稀、4-苄基氧甲氧基苯乙稀、9 -乙烯基恩、α，2-二甲基苯乙烯、这些的组合等等。 Examples  The reactant (a) include styrene, alpha] -methylstyrene, t-butylstyrene, 1,3_ diisopropenylbenzene, 2,4,6-trimethyl-styrene, 2 , 4-methylstyrene, 2,4-diphenyl-4-methyl-1-pentene, ethylene 2,5-dimethylbenzene, 2-vinyl Cai, 3-methylacetophenone dilute, 4-benzyloxy-methoxybenzene ethylene, 9 - vinyl Keene, α, 2- dimethyl styrene, combinations of these, and the like. 这些可以被取代或未被取代。 These may be substituted or unsubstituted. 树脂的示例性实施方式包含，相对于100 重量份的用于形成该树脂的反应物，约10至70重量份的反应物(a)。 Exemplary embodiments of the resin include, with respect to the reaction of the resin, from about 10 to 70 parts by weight of reactant (a) 100 parts by weight is formed. 反应物(b)的实例包括不饱和的或其他可自由基聚合的酸类(或其酸酐）。 Examples  The reaction product of (b) include unsaturated radically polymerizable or other acids (or anhydrides thereof). 在一些实施方式中，由一种或多种具有一个或多个酸基团的羧酸或其酸酐来提供反应物(b)。 In some embodiments, of one or more compounds having one or more carboxylic acid groups or its anhydride to provide a reactant (b). 实例包括，（甲基)丙烯酸、山梨酸、马来酸酐、马来酸、棕榈油酸、油酸、亚油酸、花生四烯酸、安息香酸、富马酸、巴豆酸、衣康酸、这些的相应酸酐（如果有的话）、这些的组合等等。 Examples include (meth) acrylic acid, sorbic acid, maleic anhydride, maleic acid, palmitoleic acid, oleic acid, linoleic acid, arachidonic acid, benzoic acid, fumaric acid, crotonic acid, itaconic acid, the corresponding anhydrides (if any), combinations of these, and the like. 树脂的示例性实施方式包含，相对于100重量份的用于形成该树脂的反应物，约0.2至20重量份的反应物(b)。 Exemplary embodiments of the resin include, with respect to the reaction of the resin, about 0.2 to 20 parts by weight of reactant (b) 100 parts by weight is formed. 优选地，酸官能度异常地高，因为掺入树脂中的一种或多种酸官能反应物是制备树脂所用全部反应物的总重量的至少3重量％、至少4重量％、至少5重量％、以及至多10、15 或20重量％。 Preferably, the acid functionality is abnormally high, because one kind of resin containing one or more acid functional reactant is prepared on the total weight of all the resin reactant with at least 3% by weight, of at least 4% by weight, at least 5 wt% and up to 10, 15 or 20% by weight. 反应物(c)的实例包括乙烯基酯类、乙烯基醚类、内酰胺类，诸如N-乙烯基-2-吡咯烷酮、（甲基)丙烯酰胺、N-取代的（甲基)丙烯酰胺、（甲基)丙烯酸辛酯、壬基酚乙氧化物（甲基)丙烯酸酯、（甲基)丙烯酸异壬酯、1，6_己二醇（甲基)丙烯酸酯、（甲基)丙烯酸异冰片酯、 (甲基)丙烯酸2-(2-乙氧基乙氧基）乙酯、（甲基)丙烯酸2-乙基己酯、（甲基)丙烯酸月桂酯、 (甲基）丙烯酸羧基乙酯、（甲基）丙烯酸丁酯、（甲基)丙烯酸异丁酯、脂环族环氧化物、α-环氧化物、（甲基）丙烯酸2-羟乙酯、（甲基）丙烯腈、马来酸酐、衣康酸、（甲基）丙烯酸异癸酯、（甲基）丙烯酸十二烷基酯、（甲基）丙烯酸正丁酯、（甲基）丙烯酸甲酯、（甲基）丙烯酸己酯、（甲基）丙烯酸、N-乙烯基己内酰胺、（甲基）丙烯酸硬脂酯、羟基官能化的己内酯（甲基） 丙烯酸 Examples  The reactant (c) include vinyl esters, vinyl ethers, lactams, such as N- vinyl-2-pyrrolidone, (meth) acrylamide, N- substituted (meth) acrylamide, (meth) acrylate, octyl acrylate, nonylphenol ethoxylate (meth) acrylate, (meth) acrylate, isononyl, 1,6_ hexanediol (meth) acrylate, (meth ) acrylate, (meth) acrylate, 2- (2-ethoxyethoxy) ethyl (meth) acrylate, 2-ethylhexyl (meth) acrylate, lauryl (meth) carboxyl acrylate, ethyl (meth) acrylate, butyl (meth) acrylate, cycloaliphatic epoxide, alpha] epoxides, (meth) acrylate, 2-hydroxyethyl (meth) acrylonitrile, maleic anhydride, itaconic acid, (meth) acrylate, isodecyl (meth) acrylate, lauryl (meth) acrylate, n-butyl (meth) acrylate, (meth yl) acrylate, hexyl (meth) acrylate, N- vinyl caprolactam, (meth) acrylate, stearyl acrylate, hydroxy functional polycaprolactone (meth) acrylate, 酯、（甲基）丙烯酸十八烷基酯、（甲基）丙烯酸异辛酯、（甲基）丙烯酸羟乙酯、（甲基） 丙烯酸羟甲酯、（甲基）丙烯酸羟丙酯、（甲基）丙烯酸羟异丙酯、（甲基）丙烯酸羟丁酯、（甲基)丙烯酸羟异丁酯、（甲基)丙烯酸四氢糠基酯、这些的组合等等。 Ester, (meth) acrylate, stearyl (meth) acrylate, isooctyl (meth) acrylate, hydroxypropyl (meth) acrylate, hydroxyalkyl (meth) acrylate, hydroxybutyl ( meth) acrylate, hydroxy isopropyl acrylate, (meth) acrylate, hydroxy butyl (meth) acrylate, hydroxy butyl (meth) acrylate, tetrahydrofurfuryl acrylate, combinations of these, and the like. 树脂的示例性实施方式优选包含，相对于100重量份的用于形成该树脂的反应物， 约10至80重量份的反应物(C)。  An exemplary embodiment of the resin preferably comprises, relative to the reaction product of the resin, from about 10 to 80 parts by weight of the reaction product (C) 100 parts by weight is formed. 可用在水性组合物中的树脂可以利用当前已知的或未来开发的各种适当聚合技术由构成反应物聚合而成。  can be used in the aqueous resin composition may utilize a variety of currently known or future developed suitable polymerization techniques by the polymerization reaction was configured from. 美国专利公开号2007/0110981Α1(2010年5月17日）中进一步描述了这些技术。 US Patent Publication No. 2007 / 0110981Α1 (2010 Nian 5 17 May) are further described in these technologies. 根据一个示例性聚合方案，树脂优选利用一种或多种烯属不饱和单体通过链增长聚合制备。  According to an exemplary embodiment polymeric resin preferably with one or more ethylenically unsaturated monomers by chain growth polymerization. 聚合反应可以在各种各样的温度下、例如在约l〇°C至200°C范围内的温度下进行。 The polymerization reaction may, for example, at a temperature in the range of about l〇 ° C to 200 ° C range at various temperatures. 优选的树脂是胶乳聚合物，其通常利用一种或多种水溶性自由基引发剂制备。 Preferred resins are latex polymer, typically using one or more water soluble free radical initiator was prepared. 适于用在最终树脂组合物中的引发剂是本领域普通技术人员已知的，或者可以利用标准方法确定。 Suitable for use in the final resin composition initiators are known to those of ordinary skill in the art, or can be determined using standard methods. 具有代表性的水溶性自由基引发剂包括过氧化氢;叔丁基过氧化物;碱金属过硫酸盐，诸如过硫酸钠、过硫酸钾和过硫酸锂;过硫酸铵;和这些引发剂与还原剂的混合物。 Representative water-soluble free radical initiators include hydrogen peroxide; tert-butyl peroxide; alkali metal persulfates such as sodium persulfate, potassium persulfate, and lithium sulfate; ammonium persulfate; these initiator reductant mixture. 具有代表性的还原剂包括亚硫酸盐，诸如碱金属焦亚硫酸盐、次亚硫酸盐和次硫酸盐；甲醛次硫酸钠； 和还原糖，诸如抗坏血酸和异抗坏血酸。 Representative reducing agents include sulfites, such as alkali metal metabisulfite, sulfite and hyposulfite times; sodium formaldehyde sulfoxylate; and reducing sugars such as ascorbic acid and isoascorbic acid. 引发剂的量，基于单体的总量，优选为约0.01至3wt%。 The amount of initiator, based on the total monomers, preferably about 0.01 to 3wt%. 在氧化还原体系中，还原剂的量，基于单体的总量，优选为约0.01至3wt%。 In the redox system, the amount of reducing agent, based on the total monomers, preferably about 0.01 to 3wt%. 优选的胶乳聚合物通常通过一种或多种非离子或阴离子乳化剂稳定，这些乳化剂单独使用或者组合使用。  The latex polymers are typically preferred by one or more nonionic or anionic emulsifiers stabilize, these emulsifiers used alone or in combination. 适于用在最终顶涂层组合物中的乳化剂是本领域技术人员已知的，或者可以利用标准方法确定。 Suitable for use in the final topcoat composition of emulsifiers are known to the skilled person, or can be determined using standard methods. 适当的非离子乳化剂的实例包括，叔辛基苯氧基乙基聚(39)-乙氧基乙醇、十二烷基氧聚（10)乙氧基乙醇、壬基苯氧基乙基聚(40)乙氧基乙醇、聚乙二醇2000单油酸酯、乙氧基化的蓖麻油、氟化的烷基酯和烷氧基化物、聚氧乙烯(20)山梨聚糖单月桂酸酯、鹿糖单椰油酸酯（sucrose monococoate)、二(2-丁基)苯氧基聚(20)乙氧基乙醇、羟乙基纤维素聚丙烯酸丁酯接枝共聚物、二甲基硅酮聚亚烷基氧接枝共聚物、聚(环氧乙烷)聚（丙烯酸丁酯）嵌段共聚物、环氧丙烷和环氧乙烷的嵌段共聚物、采用30摩尔的环氧乙烷乙氧基化的2,4,7,9_四甲基-5-癸炔-4,7-二醇、N-聚氧乙烯(20)月桂酰胺、N- 月桂基-N-聚氧乙烯(3)胺和聚（10)乙二醇十二烷基硫醚。 Examples of suitable nonionic emulsifiers include tert-octyl phenoxyethyl polyethoxy (39) - ethoxyethanol, dodecyloxy poly (10) ethoxyethanol, nonylphenoxyethyl poly (40) ethoxyethanol, polyethylene glycol 2000 monooleate, ethoxylated castor oil, fluorinated alkyl esters and alkoxylates, polyoxyethylene (20) sorbitan monolaurate esters, sugar deer monococoate (sucrose monococoate), bis (2-butyl) phenoxypoly (20) ethoxyethanol, hydroxyethylcellulose polybutyl acrylate graft copolymer, dimethyl silicone polyalkylene oxide graft copolymer, poly (ethylene oxide) poly (butyl acrylate) block copolymer, block copolymers of ethylene oxide and propylene oxide, with 30 moles of ethylene 2,4,7,9_ ethane ethoxylated tetramethyl-5-decyne-4,7-diol, N- polyoxyethylene (20) lauramide, N- lauryl poly -N- polyoxyethylene (3) amine and poly (10) ethylene glycol dodecyl thioether. 适当阴离子乳化剂的实例包括月桂基硫酸钠、十二烷基苯磺酸钠、硬脂酸钾、二辛基磺基琥珀酸钠、十二烷基二苯基氧二磺酸钠、壬基苯氧基乙基聚（1)乙氧基乙基硫酸铵盐、苯乙烯磺酸钠、十二烷基烯丙基磺基琥珀酸钠、亚麻子油脂肪酸、乙氧基化的壬基酚磷酸酯的钠盐/钾盐/锂盐/或铵盐、辛基酚聚醚-3-磺酸钠(sodium octoxynol-3-sulfonate)、椰油酰基肌氨酸钠、1-烷氧基-2-轻丙基磺酸钠、α-烯烃(C14-C 16)磺酸钠、羟基烷醇的硫酸酯/盐、N-(l，2-二羧基乙基)-N_十八烷基磺基琥珀酰胺酸四钠、N-十八烷基磺基琥珀酰胺酸二钠、烷基酰胺基聚乙氧基磺基琥珀酸二胺、磺基琥珀酸的乙氧基化的壬基苯半酯二钠和叔辛基苯氧基乙氧基聚（39)乙氧基乙基硫酸的钠盐。 Examples of suitable anionic emulsifiers include sodium lauryl sulfate, sodium dodecylbenzenesulfonate, potassium stearate, dioctyl sodium sulfosuccinate, sodium dodecyl diphenyl oxide disulfonate, nonyl phenoxyethyl polyethoxy (1) ethoxyethyl sulfate ammonium salt, sodium styrene sulfonate, sodium dodecyl allyl sulfosuccinate, linseed oil fatty acids, ethoxylated nonylphenol sodium phosphate / potassium / lithium salt / or ammonium salts, octoxynol-3-sulfonate (sodium octoxynol-3-sulfonate), sodium cocoyl sarcosinate, 1-alkoxy - light-propyl-2- sulfonate, sodium alpha] -olefin (C14-C 16) sulfonate, sulfates of hydroxyl alkanols / salt, N- (l, 2- dicarboxyethyl) -N_ octadecyl sulfo succinamic acid, tetrasodium N- octadecyl disodium sulfosuccinamate, alkyl amido polyethoxy sulfosuccinate diamine, sulfosuccinate ethoxylated nonylphenyl disodium half ester, and t-octyl phenoxy ethoxy polyethylene (39) ethoxyethyl sulfate sodium salt. 在一些实施方式中，水性组合物是胶乳组合物的形式。  In some embodiments, the composition is in the form of an aqueous latex composition. 该胶乳组合物可以包含单级和/或多级胶乳聚合物。 The latex composition may comprise a single and / or multi-stage latex polymer. 优选的单级胶乳聚合物具有至少-5°C、更优选至少15°C、最优选至少25°C、最好至少30°C的玻璃化转变温度(Tg)。 Preferred single stage latex polymers having at least -5 ° C, more preferably at least 15 ° C, most preferably at least 25 ° C, preferably at least 30 ° C glass transition temperature (Tg). 优选使用的单级胶乳聚合物具有小于75 °C、更优选小于65 °C、最优选小于55°C的Tg。 Single-stage latex polymer is preferably used having a Tg of less than 75 ° C, more preferably less than 65 ° C, most preferably less than of 55 ° C. Tg可以在本发明的实施中利用差示扫描量热仪(DSC)技术测定。 Tg can be measured using techniques differential scanning calorimeter (DSC) in the embodiment of the present invention. 还可能有利的是，使用利用连续变化的单体进料制成的梯度Tg胶乳聚合物。  may also be advantageous to use the use of continuously varying monomer feed gradient Tg latex polymer. 所得聚合物通常具有这样的DSC曲线，该DSC曲线不具有Tg拐点，并且可以说具有基本上无限个数的Tg阶梯。 The resultant polymer generally has a DSC curve of the DSC curve does not have a Tg inflection points, and may be said to have a substantially infinite number of Tg step. 例如，可由高Tg的单体物料开始，然后在聚合的某一点开始向高Tg硬级单体物料中加料低Tg软级单体组合物。 For example, a high Tg monomer feed can be started, and then it began to feed a low Tg soft stage monomer composition into the high Tg hard stage monomer feed in a polymerization. 所得多级胶乳聚合物将具有由高至低的梯度Tg。 The resulting multistage latex polymer will have a gradient Tg from high to low. 在另一实施方式中，可能有利的是将高Tg硬级单体组合物加料到低Tg软级单体组合物中。 In another embodiment, it may be advantageous to high Tg hard stage monomer composition was charged into a low Tg soft stage monomer composition. 梯度Tg聚合物也可以与多Tg聚合物一起使用。 Gradient Tg polymer may also be used in conjunction with multiple Tg polymers. 除了本文所述的可自由基聚合树脂以外，树脂组分还可选包含一种或多种其他种类的树脂组分。  In addition to herein radically polymerizable resin, the resin component optionally further comprises one or more other kinds of resin components. 优选地，这些可与可自由基聚合树脂基本上混溶，结果基本上避免了树脂之间的过度相分离。 Preferably, these can be substantially miscible with the radical polymerizable resin, the result is substantially avoided excessive separation between the resin phase. 其他树脂的实例包括聚氨酯、聚酰胺、聚酰亚胺、卤化聚合物、聚硅酮、聚酯、醇酸树脂、聚烯烃、（甲基)丙烯酸类树脂、这些的组合等等。 Examples of other resins include polyurethanes, polyamides, polyimides, halogenated polymers, silicones, polyesters, alkyd resins, polyolefins, (meth) acrylic resins, combinations of these and the like. 除了包含在树脂组分中的一种或多种树脂以外，水性涂料组合物通常还包含至少一种非粘结剂颗粒(也被称为颜料）。  In addition to the one or more resins contained in the resin component, the aqueous coating composition typically further comprises at least one non-binder particles (also referred to as pigment). 添加这些颗粒以帮助粘附、帮助控制涂覆性质等等。 These particles are added to aid in adhesion, assist in controlling the coating properties and the like. 此外，非粘结剂颗粒可被添加到涂料中，以起到下述关于可选额外成分的作用中的一个或多个。 In addition, non-binder particles may be added to the coating to effect one or more of the following functions on the optional additional ingredients. 这些颗粒可以是有机的和/或无机的。 These particles may be organic and / or inorganic. 无机颗粒是更优选的。 The inorganic particles are more preferred. 颗粒可以具有各种形状，诸如片形、针状、椭圆形、圆形、球形、不规则形状、这些的组合等等。 The particles may have various shapes, such as a sheet-shaped, acicular, oval, circular, spherical, irregular, combinations of these, and the like. 在一些优选的实施方式中，水性涂料组合物包含足够量的非粘结剂颗粒(优选无机颗粒），结果由该涂料组合物制成的所得涂层包含，基于干涂层的总体积，约15至85、优选约20至80、更优选约25至80体积百分比的颗粒。  In some preferred embodiments, the aqueous coating composition contains a sufficient amount of a non-binder particles (preferably inorganic particles), the results of the resultant coating made of the coating composition comprises, based on total dry coating volume, about 15 to 85, preferably from about 20 to 80 percent and more preferably about 25 to 80 volume particle. 这些非粘结剂颗粒与成膜颗粒(例如成膜胶乳聚合物颗粒)是不同的，因为成膜颗粒基本上聚结并且协助形成所得涂层中的粘结剂基质的一部分。 These non-film-forming particles and binder particles (e.g., film-forming latex polymer particles) are different, because the particles are substantially coalesce and forming a part of the binder matrix to assist in the formation of the resulting coating. 因此，关于颗粒的术语"非粘结剂"是指，颗粒当被掺入所得涂层中时保留它们的颗粒特性(要么单独的要么作为团聚体或聚集体)的至少一部分、优选基本上全部。 Thus, the particles on the term "non-adhesive" refers to the particles retain their particle properties (either alone or as agglomerates or aggregates) when incorporated in the resultant coating at least a portion, preferably substantially all . 优选的非粘结剂颗粒在用于形成所得涂层的条件下基本上不成膜。 Preferred substantially non-film-forming binder particles under conditions for the formation of the resultant coating layer. 就这样颗粒的任意部分可能从涂层表面突出而言，为了计算颗粒在涂层中的颜料体积浓度(PVC)的目的，那些突出部分被认为是颜料体积的一部分。 In this way any portion of the particles may protrude from the surface of the coating concerned, the purpose of calculating the particle in the coating pigment volume concentration (PVC), and those considered to be part of the protruding portion of the pigment volume. 可选地，水性涂料组合物中的至少一部分的颜料含量包括一种或多种片形颜料颗粒。  Alternatively, at least part of the pigment content of the aqueous coating composition comprises one or more platelet-shaped pigment particles. 当在本文中使用时，片形颗粒具有大于3:3:1、优选大于10:10:1的X:Y:Z尺寸长宽比。 As used herein, the platelet-shaped particles greater than 3: 1 The X-:: 3: 1, preferably greater than 10: 10 Y: Z size aspect ratio. 因此，非片形颗粒具有3:3:1或更小的Χ:Υ:Ζ尺寸长宽比。 Thus, non-platelet-shaped particles have a 3: 3: 1 or less Χ: Υ: Ζ size aspect ratio. 因此，其长宽比为10:12:1的颗粒应当是片形的，而长宽比为12:2:3或2:2:1的颗粒将不是片形的。 Therefore, an aspect ratio of 10: 12: 1 particles should be sheet-shaped, the aspect ratio of 12: 2: 3 or 2: 2: 1, the particles are not plate-shaped. 片形颗粒具有优异的增稠性质、提供优异的抗下垂性、还提供改进的涂覆性能。  The platelet-shaped particles having excellent thickening properties to provide excellent sag resistance, but also provides improved coating properties. 反过来，如果仅非片形颗粒用在水性涂料组合物中，那么为了实现所需水平的增稠和/或抗下垂性可能不得不使用过度过量的这种非片形颗粒。 Conversely, if only non-platelet-shaped particles used in the aqueous coating composition, then in order to achieve the desired level of thickening and / or sag resistance may have to use an excess over such non-shaped particles. 片形颜料的实例包括如下中的一种或多种:粘土诸如瓷土、云母、滑石、高岭土、茂铁氧化物(ΜΙ0)、这些的组合等等。 Examples of shaped pigment  The sheet comprises one or more of: clays such as china clay, mica, talc, kaolin, ferrocene oxide (ΜΙ0), combinations of these, and the like. 有利地，瓷土与一些其他片形颗粒相比对光泽的影响更小，这在需要较高光泽的顶涂层时是有益的。 Advantageously, clay and other platelet-shaped particles compared to smaller influence on the gloss, which is beneficial when the top coat requires a higher gloss. 片形颗粒的尺寸可以在细小尺寸的颗粒至粗颗粒的宽范围内变化。  The size of the sheet-shaped particles may vary over a wide range of fine size particles to coarse particles. 在示例性实施方式中，片形颗粒可以具有在约0.5至50微米的范围内、优选约1至10微米的范围内、更优选约3至5微米的范围内的尺寸。 In an exemplary embodiment, the platelet-shaped particles may have a range of about 0.5 to 50 microns, preferably in the range of about 1 to 10 microns, more preferably in the range of sizes from about 3 to 5 microns. 如果使用片形颗粒，那么在一些实施方式中希望水性涂料组合物中的所有颜料含量并不都仅仅是片形颗粒形式。  Using sheet-shaped particles, it is desirable in some embodiments all of the pigment content of the aqueous coating composition not only are platelet-shaped particles. 因此，在一些实施方式中，水性涂料组合物中的颜料理想地包含与至少一种片形颗粒组合使用的至少一种非片形颗粒。 Thus, in some embodiments, the pigment is desirably in the aqueous coating composition comprises at least one non-shaped particles of at least one sheet-shaped particles in combination with the use. 各种各样的非片形颗粒都可以与片形颗粒组合使用。  The various non-platelet-shaped particles may be used in combination with a platelet-shaped particles. 实例包括一种或多种不溶性硫酸盐;一种或多种不溶性碳化物；一种或多种不溶性氮化物；一种或多种不溶性氧氮化物;一种或多种不溶性氧碳化物;一种或多种不溶性氧化物;一种或多种不溶性碳酸盐;一种或多种不溶性硅酸盐;这些的组合等等。 Examples include one or more insoluble sulfates; a carbide of one or more insoluble; one or more insoluble nitride; one or more insoluble oxynitride; one or more insoluble oxycarbide; a one or more insoluble oxides; one or more insoluble carbonates; one or more insoluble silicates; combinations of these and the like. 这些的实例包括， 金属、镧系金属、婀系金属、Si、Ge、Ga、Al、Sn、Pb中的一种或多种的硫酸盐、碳化物、氮化物、 氧化物、氧氮化物、氧碳化物、和/或碳酸盐，这些的组合等等。 Examples of these include metals, lanthanide metals, Ada-based metal, Si, Ge, Ga, Al, Sn, Pb of one kind or more of sulfate, carbides, nitrides, oxides, oxynitrides, oxycarbide and / or carbonate, combinations of these and the like. 这样颗粒的具体实施方式包括BaS〇4、氧化钛、31(：、3111^、1^1碳酸钙、二氧化硅、二氧化铝、硅酸铝、硅酸钾铝、氢氧化铝、钙硅石、这些的组合等等。在一些配制品中，BaSO 4是优选的。这种颜料有助于保持光泽、有助于增稠水性涂料组合物同时允许空气逸出，并有助于为所得涂层提供希望水平的渗透性，结果湿气良好地进出所得涂层。 DETAILED this embodiment comprises BaS〇4 particles, titanium oxide, 31 (:, 3111 ^, 1 ^ 1 calcium carbonate, silica, alumina, aluminum silicate, potassium silicate, aluminum hydroxide, wollastonite , combinations of these, etc. in some formulations, BaSO 4 is preferred. this helps to maintain the luster pigment, helps thicken aqueous coating compositions while allowing air to escape and contribute to the resulting coating layer provides a desired level of permeability, good results moisture out of the resulting coating. 非片形颗粒的尺寸可以在细小尺寸的颗粒至粗颗粒的宽范围内变化。  The size of the non sheet-shaped particles may vary over a wide range of fine size particles to coarse particles. 在示例性实施方式中，非片形颗粒可以具有在约0.1微米至50微米的范围内、优选约0.5至10微米的范围内的尺寸。 In an exemplary embodiment, the non-platelet-shaped particles may have a range from about 0.1 to 50 microns, the size in the range of preferably from about 0.5 to 10 microns. 片形颜料与非片形颜料的重量比可以在宽范围内变化。  The platelet-shaped pigment weight ratio of non-platelet-shaped pigment may vary within a wide range. 在示例性的实施方式中， 该比值可以在约1: 50至50:1的范围内、优选在约1:10至10:1的范围内、更优选约1:3至3:1 的范围内。 In an exemplary embodiment, the ratio can range from about 1:, preferably from about 10 to 10 within the range of 1:: 1 range, and more preferably about 1: 1: 3-3 50-50 Inside. 例如，水性涂料组合物的一个实施方式包含，基于涂料固体的总重量，约14.5重量％的相对圆形BaSO 4颗粒和约14.5重量％的片形瓷土。 For example, one embodiment embodiment the aqueous coating composition comprises, based on total weight of coating solids, about 14.5 wt% relative circular BaSO 4 particles, and about 14.5% by weight of platelet-shaped clay. 水性涂料组合物的附加颗粒组分可以为下述一种或多种额外成分的形式。  Additional components of the aqueous coating composition particles may be in the form of one or more of the following additional ingredients. 树脂组分是与水性液体载剂混合的。  The resin component is mixed with the aqueous liquid vehicle. 本文中使用的"水性"是指，基于所述载剂的总重，至少约5重量％、优选至少约20重量％、更优选至少约40重量％、甚至更优选至少约60 重量％、甚至90重量％或更多的载剂是水。 "Aqueous" as used herein refers to, based on the total weight of the carrier, at least about 5 wt%, preferably at least about 20 wt%, more preferably at least about 40% by weight, and even more preferably at least about 60% by weight, or even 90% or more by weight of the carrier is water. 最优选地，约85至100重量％、更优选约95至99重量％是水。 Most preferably, about 85 to 100 wt%, more preferably from about 95 to 99 wt% water. 除了水以外，水性涂料组合物的水性载剂还可选包含一种或多种额外的可选共载剂。  In addition to water, the aqueous carrier of the aqueous coating composition also optionally additional, optional co-agent comprises one or more carrier. 出于各种目的（包括协助成膜和/或漆料稳定），可以使用共载剂。 For various purposes (including assisting the film formation and / or stabilization paints), co-carrier may be used. 适当共载剂的实例包括，丁基溶纤剂（butyl cellosoIve)、醇类（诸如丁醇）、聚结剂（例如酯醇，如Eastman Texanol产品，和/或低VOC聚结剂（如美国专利6，762，230和7，812，079中所述的）、二醇醚、 这些的组合等等。令人希望地，所谓的不含VOC的共载剂(VOC-exempt co-carrier)是优选的。 Examples of suitable co-carriers include, butyl cellosolve (butyl cellosoIve), alcohols (such as butanol), coalescing agents (e.g., ester alcohol, such as Eastman Texanol products, and / or low VOC coalescing agent (e.g., U.S. Patent No. 6 ,), glycol ethers, combinations of these, and the like according 7,812,079 762,230. desirably, the so-called non-VOC co-carrier (VOC-exempt co-carrier) is preferably of. 包含在第一水性涂料组合物中的共载剂的量可以在宽范围内变化。  The amount of the co-carrier comprising a first aqueous coating composition may vary within a wide range. 用量取决于各种因素，包括共载剂的类型、添加共载剂的目的、可能用来将第一水性涂料组合物涂覆到基材上的涂布技术等等。 The amount depends on various factors, including the type of co-carrier, the purpose of adding the co-carrier, it may be used to first aqueous coating composition to a substrate and the like on the coating technique. 在示例性实施方式中，第一水性涂料组合物可以包含，基于包含在该组合物中的共载剂和水的总重，约0.3至80重量％、优选约0.3至15重量％、更优选约1至5重量％的共载剂。 In an exemplary embodiment, the first aqueous coating composition may comprise, based on the total composition comprising the co-carrier and water weight, from about 0.3 to 80 wt%, preferably from about 0.3 to 15 wt%, more preferably about 1 to 5 wt% of co-carrier. 为了进一步增强耐热性并且帮助保持基材凉爽，可以向组合物中掺入帮助反射热量和电磁辐射并且/或者抵抗吸收热量和电磁辐射的一种或多种试剂。  In order to further enhance the heat resistance and helps to cool the substrate holder, can be incorporated to help reflect heat and electromagnetic radiation to the composition and / or against one or more reagents absorb heat and electromagnetic radiation. 这些的实例包括在本申请人于2010年7月1日递交的申请PCT/US2011/042801中描述的试剂。 Examples of these include reagents described in the present applicant on July 1, 2010 filed application PCT / US2011 / 042801. 这些试剂可以根据当前已知或未来开发的常规措施掺入涂料中。 These agents can be incorporated into a coating according to conventional measures currently known or developed in the future. 在一些实施方式中，这样的反射或吸收试剂包括非红外吸收有色颜料。  In some embodiments, such agents include a non-reflecting or absorbing infrared absorbing colored pigments. 示例性的这种颜料在性质上可以是无机的或有机的，其包括但不限于在美国专利号6,454,848 (Sliwinski等人）、6,616,744B1 (Sainz等人）、6,989,056B2(Babler)和7,157,112B2 (Haines)和在美国专利申请公开号US2005/0126441Al(Skelhorn)中涉及的那些。 Exemplary of such pigments in nature may be organic or inorganic, including but not limited to U.S. Patent No. 6,454,848 (Sliwinski et al. ), 6,616,744B1 (Sainz et al. ), 6,989,056B2 (Babler) and 7,157,112B2 ( haines) and in U.S. Patent application Publication No. US2005 / 0126441Al (Skelhorn) those involved. 无机颜料是特别理想的，其包括由各种金属形成的单一的或混合的金属氧化物，所述金属例如为铝、 锑、铋、硼、铬、钴、镓、铟、铁、镧、锂、镁、锰、钼、钕、镍、铌、硅、锡、钒或锌。 Inorganic pigments are particularly desirable, comprising a single or mixed metal formed by various metal oxides, metals such as aluminum, antimony, bismuth, boron, chromium, cobalt, gallium, indium, iron, lanthanum, lithium , magnesium, manganese, molybdenum, neodymium, nickel, niobium, silicon, tin, vanadium or zinc. 示例性的金属氧化物包括Cr2O3、Al2O3、V2O 3、Ga2〇3、Fe2〇3、Mn 2〇3、Ti2O3、In2O 3、TiBO3、 NiTi〇3、MgTi〇3、CoTi〇3、ZnTi〇3、FeTi〇3、MnTi〇3、CrB〇3、NiCr〇3、FeB〇3、FeMo〇3、FeSn(B〇3)2、 BiFe〇3、AlB〇3、Mg3Al2Si3〇i2、NdAl〇3、LaAl〇3、MnSn〇3、LiNb〇3、LaCo〇3、MgSi〇3、ZnSi〇3、Mn(Sb， Fe)03及其混合物。  Exemplary metal oxides include Cr2O3, Al2O3, V2O 3, Ga2〇3, Fe2〇3, Mn 2〇3, Ti2O3, In2O 3, TiBO3, NiTi〇3, MgTi〇3, CoTi〇3, ZnTi 〇3, FeTi〇3, MnTi〇3, CrB〇3, NiCr〇3, FeB〇3, FeMo〇3, FeSn (B〇3) 2, BiFe〇3, AlB〇3, Mg3Al2Si3〇i2, NdAl〇3 , LaAl〇3, MnSn〇3, LiNb〇3, LaCo〇3, MgSi〇3, ZnSi〇3, Mn (Sb, Fe) 03, and mixtures thereof. 适当地，金属氧化物可以具有上述美国专利号6,454,848B2中所述的刚玉-赤铁矿晶体晶格结构，或者可以是具有刚玉-赤铁矿结晶结构的主体组分，其包含一种或多种元素作为客体组分，所述元素选自铝、锑、铋、硼、铬、钴、镓、铟、铁、镧、锂、镁、锰、钼、 钕、镍、银、娃、锡、•凡和锌。 Suitably, the metal oxide may have a corundum in the aforementioned U.S. Patent No. 6,454,848B2 said - hematite crystal lattice structure, or may be a corundum - hematite main component of the crystalline structure, which comprises one or more as the guest component elements, the elements selected from aluminum, antimony, bismuth, boron, chromium, cobalt, gallium, indium, iron, lanthanum, lithium, magnesium, manganese, molybdenum, neodymium, nickel, silver, baby, tin, • Where and zinc. 这些供应商还通常以相同的商标提供具有不同于黑色的各种色彩的非红外吸收有色颜料，这些同样可以用在所公开的涂料组合物中。  These suppliers are also commonly provided with various colors other than black in the same non-infrared absorbing mark colored pigments, which can also be used in the disclosed coating compositions. 示例性非红外吸收非黑色颜料包括无机颜料，诸如氧化铁、硅酸镁、碳酸钙、铝硅酸盐、硅石和各种粘土;有机颜料，包括塑性颜料，诸如固体珠颜料(例如聚苯乙烯珠或聚氯乙烯珠）；和含有一个或多个空隙的微球颜料(例如美国专利申请公开号US 2007/0043162A1 (Bardman等人）中讨论的那些）。 Exemplary non-black non-infrared absorption pigment include inorganic pigments such as iron oxide, magnesium silicate, calcium carbonate, aluminum silicate, silica, and various clays; organic pigments include plastic pigments such as solid bead pigments (e.g., polystyrene polyvinyl chloride beads or beads); containing one or more voids and microsphere pigments (e.g., U.S. Patent application Publication No. US 2007 / 0043162A1 (Bardman et al.) discussed). 所公开的涂料组合物还可以包含非红外吸收无颜色的颜料，诸如二氧化钛和白色氧化锌，它们中的任意一种如果在没有有色颜料的情况下使用将提供白色而非有色的涂料组合物。  The disclosed coating compositions may also contain non-achromatic infrared absorption pigment, such as titanium dioxide and zinc oxide white, any one of them if used instead to provide a white colored paint in the colored pigment case without combination. 将这样的无颜色颜料添加到上述非红外吸收的有色颜料中可以提供具有变亮的色调（lightened shade)和改善遮盖力(hiding power)的彩色漆料和色料。 The addition of such non-color pigment to said non-infrared-absorbing colored pigment may provide a brighter hue (lightened shade) and improved opacity (hiding power) colored paints and stains. 该组合物理想不含或基本上不含红外吸收有色颜料，例如碳黑、黑色氧化铁、氧化棕和生褐色。 The composition desirably free or substantially free infrared absorbing colored pigments, such as carbon black, black iron oxide, brown oxide and raw umber. 如果需要，各种各样的其他附加成分可选被包含在水性涂料组合物中。  If desired, various other optional additional ingredients are included in the aqueous coating composition. 这些的实例包括一种或多种消泡助剂、研磨助剂、润湿剂、表面活性剂、聚结助剂、加工助剂、防滑剂、 耐磨剂、传导性试剂、抗静电剂、着色剂、抗腐蚀助剂、增稠剂、防下垂试剂、增塑剂、抗氧化剂、紫外稳定剂、生物杀灭剂、杀真菌剂、填料、这些的组合等等。 Examples of these include one or more antifoaming aids, grinding aids, wetting agents, surfactants, coalescing aids, processing aids, slip agents, anti-wear agents, conductive agents, antistatic agents, colorants, anti-corrosion aids, thickeners, anti-sagging agents, plasticizers, antioxidants, UV stabilizers, biocides, fungicides, filler, combinations of these, and the like. 这些可以根据当前已知的或未来发展的常规实施来使用。 These can be used in accordance with conventional practices currently known or future development. 可以利用各种技术制备水性涂料组合物。  may utilize various techniques for preparing aqueous coating compositions. 示例性的技术在如下实施例中有所描述。 Exemplary techniques are described in the following examples. 本发明的涂料体系可用于涂布各种各样的基材。 The coating system  of the present invention may be used to coat a variety of substrates. 示例性基材包括天然和建筑材料、卡车、有轨车、货运集装箱、地板材料、墙体、家具、其他建筑材料、机动车辆构件、飞机构件、海上构件、机械构件、层压板、设备构件、器具、包装等等。 Exemplary substrates include natural and building materials, trucks, railcars, freight container, flooring, walls, furniture and other building materials, motor vehicle components, aircraft components, marine components, mechanical components, laminates, equipment components, appliance, packaging and so on. 示例性的基材材料包括金属、 金属合金、金属间组合物、含金属复合物、这些的组合等等。 Exemplary substrate materials include intermetallic, metal alloys, composition metals, metal-containing composites, combinations of these, and the like. 涂料组合物可以涂覆到新基材上，或者可用于整修旧基材。 The coating composition can be coated onto a new substrate, or the substrate can be used for refurbishing old. 本发明的涂料组合物可以以各种方式涂覆到基材上。  The coating compositions of the invention may be applied to the substrate in various ways. 根据一个示例性实施方式， 提供待涂基材。 According to an exemplary embodiment, a substrate to be coated. 该基材可以是裸露的或者可至少部分被先前的涂料体系涂布过。 The substrate may be bare or may be at least partially coated with a previous coating systems. 清洁基材从而去除油脂、污垢和其他污染物可能是希望的。 Clean substrate to remove grease, dirt and other contaminants may be desirable. 可以去除也可以不去除预先存在的涂料， 这取决于具体情况。 May be removed without removing the pre-existing coating, depending on the situation. 当基材准备好了，将水性涂料组合物涂覆到基材表面的至少一部分上， 并且使其干燥。 When at least a portion of the substrate is ready, the aqueous coating composition is applied to the surface of the substrate, and dried. 如果需要，可以涂覆一层或多层额外的所述水性涂料组合物的涂层。 If desired, one or more layers may be coated with an additional coating of the aqueous coating composition. 通常， 单一涂层是适当的。 Typically, a single coating is appropriate. 本发明的涂料组合物可用于形成具有宽范围厚度的顶涂层。  The coating compositions of the invention may be used to form a top coat having a wide range of thicknesses. 在示例性实施方式中，底漆涂层具有在约15至200微米、优选约15至100微米、更优选约30至50微米的干膜厚度。 In an exemplary embodiment, the primer coating has from about 15 to 200 microns, preferably about 15 to 100 microns, more preferably about 30 dry film thickness to 50 microns. 本发明的涂料体系特别适于在货物集装箱上形成保护涂层。  The coating system of the present invention is particularly suitable for forming a protective coating on the cargo container. 优选地，该涂料体系被用于联运货物运输中涉及的货物集装箱。 Preferably, the coating system is used to transport cargo container transportation of cargo involved. 这样的集装箱中的许多至少基本上符合适用于通过如下系统中的至少一种运输的货物集装箱的国际标准，所述系统是水路运输货物的海运货物系统、铁路运输货物的系统和/或公路运输货物的系统。 Many such containers at least substantially in line with international standards applicable to the following system of at least one transport cargo containers, the system is a system of marine cargo sea transport cargo, freight rail transport system and / or road transport system cargo. 这样的集装箱在其使用寿命期间通常暴露于如风化、盐水暴露、淡水暴露、日晒等极端环境。 Such containers are usually exposed to wind technology during its service life, salt water exposure, exposure to fresh water, sun and other extreme environments. 即使这样的集装箱通常由耐腐蚀材料(诸如不锈钢和/或耐候钢)制造，但仍需要进一步的抗磨损、抗腐蚀等保护和/ 或装饰。 Even if such a container is generally corrosion resistant material (such as stainless steel and / or weathering steel), there remains a need for further anti-wear, corrosion protection and / or decoration. 传统上，本行业中存在很强的仅使用溶剂基涂料体系来保护货物集装箱的偏见。  Conventionally, in the industry there is a strong bias using only a solvent based coating system to protect the cargo container. 这种偏见是，水基涂层缺乏能承受这种挑战性的环境所需要的那种性能，并且水基涂层难以涂覆和实现具有较少缺陷的涂层。 This bias is, water-based coating that can withstand the lack of performance of this challenging environment needed, and the water-based coating is difficult to achieve a coating having a coating and fewer defects. 令人惊讶地，本发明提供的水基涂料体系当用于装饰或保护这样的货物集装箱时表现出优异的性能。 It exhibits excellent performance when Surprisingly, water-based coating systems of the present invention provides a decorative or protective when such cargo containers. 所得顶涂层能够承受通常绝大部分而言仅溶剂基体系得以满足的挑战性行业测试。 The resulting topcoat layer is typically able to withstand the most part the industry challenge test is satisfied only in solvent based systems. 例如，本发明的涂层通过了针对耐湿气性的适用的盐雾测试标准并且提供了优异的涂覆特性。 For example, the coating of the present invention for moisture resistance by the applicable standard salt spray test and provides excellent coating properties. 图1和图2中所示的示例性联运货物集装箱10在本行业中通常被称为冷藏货物集装箱。  FIG 1 an exemplary intermodal cargo container 210 shown in the industry and is commonly referred to refrigerated cargo container. 这些集装箱通常包含框架12,其限定集装箱10的边界。 These containers typically comprise a frame 12, which defines the boundaries 10 of the container. 框架12通常由金属、金属合金、 金属间组合物、金属组合物、这些的组合等制成。 Frame 12 is usually made of metal, metal alloys, intermetallic compositions, metallic compositions, combinations of these, and the like. 耐候钢由于其耐腐蚀性通常用于制备框架12的全部或一部分。 Because of its corrosion resistance, weathering steel commonly used for the preparation of all or a portion 12 of the frame. 耐候钢的表面以与铝类似的方式氧化，不过这种氧化形成阻隔以保护下面的钢免于进一步腐蚀。 Weathering steel surface to a similar manner to aluminum oxide, but this is oxidized to form a barrier to protect the steel from further corrosion below. 根据ASTM标准，可得到包括A242、A588和A602等级的耐候钢。 According to ASTM standards, can be obtained including weathering steel A242, A588 and A602 class. 壁面、地板和天花面板14通过螺栓、焊接、铆钉等连接到该框架12上。  wall, floor and ceiling panel 14 is connected to the frame 12 by bolts, welding, rivets and the like. 焊接往往广泛地用于提供成本有效的、不透风雨的连接方式。 Welding is often widely used to provide cost-effective, weather-tight connection. 面板14可由各种各样的金属、金属合金、 金属间组合物或其他含金属材料制成。 Panel 14 may be various metals, metal alloys, intermetallic compositions, or made of other metal-containing materials. 在一些实施方式中，壁面、地板和/或天花面板14的至少一部分由不锈钢制成。 In some embodiments, the wall, floor and / or at least a portion of the ceiling panel 14 is made of stainless steel. 铁素体不锈钢广泛用在本行业中制造冷藏货物集装箱的面板。 Ferritic stainless steel is widely used in making refrigerated cargo container panels in the industry. 在冷藏货物集装箱10的典型制造方式中，框架12通过诸如用金属化的锌(镀锌)涂布框架12或者用富Zn底漆涂布得以受到保护，从而免受腐蚀。  In an exemplary embodiment for producing refrigerated cargo container 10, the frame 12 such as by use of metal zinc (galvanized) or the frame 12 coated with a Zn-rich primer coating is protected from such corrosion. 在保护框架12免受腐蚀之前或之后，将不锈钢壁面面板14焊接到该框架12上。 Before the protection against corrosion or after frame 12, the stainless steel panel 14 is welded to the wall surface of the frame 12. 如果将面板14焊接到框架12上然后为该框架12提供腐蚀防护，那么为了方便起见除了可以涂布不锈钢壁面面板14的与框架相邻的小边界区域以帮助确保框架12的完全覆盖以外，该面板14不需腐蚀防护涂布。 If the panel 14 is welded to the frame 12 and provides for corrosion protection on the frame 12, for convenience it may be applied in addition to a small stainless steel frame boundary area adjacent to the wall panel 14 to help ensure complete coverage of the outside of the frame 12, which panel 14 without corrosion protection coating. 作为实例，这样的边界区域可以具有约0.5cm至IOcm的宽度。 As an example, such a boundary region may have a width of from about 0.5cm to IOcm. 此外，如果使用富Zn底漆涂布框架12,那么希望将富Zn底漆与环境大气中的水隔离。  Furthermore, if the frame 12 a Zn-rich primer coating, it is desirable to Zn-rich primer and the ambient atmosphere of the water separator. 因此，希望在包含Zn作为组分的下面涂层中的至少一部分上、优选基本上全部上涂覆防水涂层。 Accordingly, it is desirable at least a portion below the coating comprises a Zn component is preferably coated with a waterproof coating on substantially all. 双组份的环氧组合物广泛用于在下面的底漆上形成防水涂层。 Two-component epoxy compositions are widely used for forming a waterproof coating on an underlying primer. 常规地，环氧涂层不仅可以形成在含有富Zn底漆的框架12上，而且环氧涂层还形成在整个壁面面板14上。 Conventionally, epoxy coating may be formed only on the frame 12 containing the Zn-rich primer, but epoxy coatings are also formed on the entire wall surface of the panel 14. 由于难以将顶涂层粘附到不锈钢上，所以过去用环氧涂布暴露的不锈钢表面来帮助提供与顶涂层更相容的表面。 Since it is difficult topcoat adhered to the stainless steel, the stainless steel surface with an epoxy coating over the exposed surfaces to help provide a more compatible with the top coat. 相反，本发明的顶涂层当被直接涂覆到暴露的不锈钢(包括铁素体不锈钢)表面上时显示优异的粘附性。  In contrast, according to the present invention, when a top coat is applied directly to the exposed stainless steel (including ferritic stainless steel) display excellent adhesion on the surface. 不需要中间涂层来促进对不锈钢的粘附，但是如果需要可以使用这样的粘附促进涂层。 No intermediate coating layer to promote adhesion to stainless steel, may be used if desired to promote adhesion of such coatings. 在本发明的实施中，本发明在不锈钢面板通常未被环氧底漆涂布的情况下是更有效、更快速、更经济的。 In the embodiment of the present invention, the present invention is more effective in the case where the epoxy primer coating are not typically stainless steel panels, faster and more economical. 因此，在一些实施方式中，将防水环氧底漆涂覆到集装箱10上，使得不锈钢表面中的至少一部分通常仍是暴露的。  Thus, in some embodiments, the epoxy primer can be applied to the water to the container 10, so that at least a portion of the stainless steel surfaces remains generally exposed. 在这样的实施方式中，防水涂层主要涂覆在下面的框架12 上，其中集装箱表面的很少(如果有的话)的其他部分被涂布。 In such an embodiment, the waterproof coating applied on the main frame 12 below, where little (if any) of the other portions of the container surface is coated. 在这些实施方式中，不锈钢壁面面板14如愿地未被这种底漆大量涂布，但是为了方便起见面板的与该框架相邻的小边界区域可以被涂布。 In these embodiments, the wall surface of the stainless steel panels 14 desirably not large number of such primer coating, but for convenience the frame adjacent to the boundary region sake small panel may be coated. 作为实例，这样的边界区域(如果有的话)可以具有约〇.5cm至IOcm的宽度。 As an example, such a boundary region (if any) may have a width of from about 〇.5cm to IOcm. 因此，在涂覆环氧底漆后，货物集装箱14通常包含至少两种表面。  Thus, after the epoxy primer coating, cargo container 14 generally comprises at least two surfactants. 第一表面部分相应于被环氧底漆涂布的框架12,而第二表面部分包括面板14上的暴露不锈钢。 The first surface portion 12 corresponding to the frame epoxy primer is coated, the second surface portion comprises an exposed stainless steel panel 14. 然后，本发明的水性涂料组合物用于在所述第一表面部分和第二表面部分的至少一部分上形成涂层。  Then, the aqueous coating composition of the present invention for forming a coating on the first surface portion and at least a portion of the second surface portion. 更优选地，货物集装箱10的至少基本上整个外部都被水性涂料组合物涂布。 More preferably, at least substantially the entire exterior of the cargo container are coated with the aqueous coating composition 10. 可以利用任何适当技术，诸如通过刷涂、喷涂、旋涂、辊涂、帘涂、浸涂、凹面涂布等等， 涂覆该组合物。 Any suitable technique may be utilized, such as by brushing, spraying, spin coating, roll coating, curtain coating, dip coating, gravure coating, etc., of the coating composition. 所得涂层对两种表面部分都具有优异的粘附性。 The resulting coating of the two surface portions have excellent adhesion. 可选地，集装箱10的内部可以采用类似方案涂布。 Alternatively, the inner container 10 may be coated with a similar scheme. 理想地，利用无气喷涂技术或空气辅助的无气喷涂技术涂覆本发明的涂层。  Desirably, the coating technique using airless spray or air-assisted airless spray coating technique of the present invention. 无气喷涂是一种在无需使用压缩空气的情况下使漆料雾化的方法。 Airless spray atomized paint is a so without the need for a method using compressed air. 在高压下将漆料栗吸到无气喷枪中，其中漆料在高压下受迫通过喷枪前部的喷嘴梢。 Under high pressure airless spray gun paint Li sucked in, which the paint is forced under high pressure through the nozzle tip of the front portion of the gun. 无气喷射允许提高速度以及减少覆盖。 It allows for increased speed airless and reduced coverage. 在空气协助的无气喷射过程中，通过无气栗提供液体压力，并且将压缩空气由无气梢(嘴）引入到喷雾中，从而改善雾化的细度。 In the airless spraying process air assist is provided by fluid pressure airless Li, and the compressed air is introduced into the airless spray tip (nozzle), so as to improve the fineness of atomization. 尽管通过使用这些技术可以改善速度和效率，但是这些技术的缺点是可能在涂覆的涂层中形成被截留的空气。 While the speed and efficiency can be improved by the use of these techniques, but the disadvantage of these techniques is likely to form air trapped in the applied coating. 由于在胶乳聚合物基涂料中使用各种表面活性剂和分散剂，所以空气截留非常难以克服。 The use of various surfactants and dispersing agents in latex polymer-based paint, it is very difficult to overcome air entrapment. 令人惊讶地，本发明可以使得当采用这些喷射技术时制备的涂层具有显著减少的缺陷。 Surprisingly, the present invention can be prepared such that the coating When these injection techniques have significantly reduced defects. 本发明的所得涂层对打底的和未打底的金属表面二者都显示优异的粘附性。  The resultant coatings of the invention to both surfaces of the metal primed and unprimed show excellent adhesion. 因此，本发明特别有利于直接在不锈钢表面上形成顶涂层，而不需要使用中间联系层。 Accordingly, the present invention is particularly advantageous form a top coat directly on the steel surface, without the use of an intermediate tie layer. 本发明采用水基组合物实现这种粘附的事实是特别有利而且是特别出乎意料的，因为甚至常规的溶剂基涂料体系针对不锈钢表面都具有粘附问题。 The fact that the present invention is a water-based adhesive composition to achieve this is particularly advantageous and is especially surprising, since even a conventional solvent-based coating systems for steel surfaces have adhesion problems. 在一些实施方式中，冷藏构件16被结合到集装箱10中，此后该集装箱将用涂料体系进一步保护。  In some embodiments, the member 16 is coupled to the refrigerator 10 in the container, after the container is further protective coating system. 在另一些情况下，将涂料体系涂覆到集装箱10的其他部件上之后，将冷藏构件16结合到该集装箱10中。 In other cases, after the coating system is applied to the other components of the container 10, the member 16 coupled to the refrigerator 10 in the container. 销售链中的制造商、用户或其他实体也可以涂覆保护性涂料体系。 Distribution chain manufacturer, user or other entity may also be coated with a protective coating system. 门18可以采用相同的或不同的涂料体系保护。 Door 18 may be the same or different protective coating systems. 通常，门18单独制造，然后在集装箱涂布完成后将其安装到集装箱10上。 Typically, the door 18 separately manufactured, and then after completion of the coating container mounted on the container 10. 水性涂料组合物的一些实施方式可用于在其他种类的基材表面上形成顶涂层。  Some embodiments of the aqueous coating composition may be used to form a top coating on the surface of other types of substrates. 例如，水性涂料组合物可以在其中掺有一种或多种氯化树脂的下面底漆层上形成顶涂层，如本申请人的与此申请同时递交的、题名为"WATER-BASED COATING SYSTEM WITH MPR0VED MOISURE AND HEAT RESISTANCE"的共同待审申请中所述的。 For example, aqueous coating compositions may be incorporated therein is formed on the primer layer a top coat of one or more of the following chlorinated resins, such as the present applicant filed simultaneously with this application, entitled "WATER-BASED COATING SYSTEM WITH MPR0VED MOISURE AND HEAT RESISTANCE "in the co-pending application described. 此申请描述了例如在干货集装箱上形成这样的涂层。 This application describes the example of forming such a coating on a dry container. 现在，参考如下示例性实施例来描述本发明。  Now, with reference to the following exemplary embodiments of the present invention will be described. 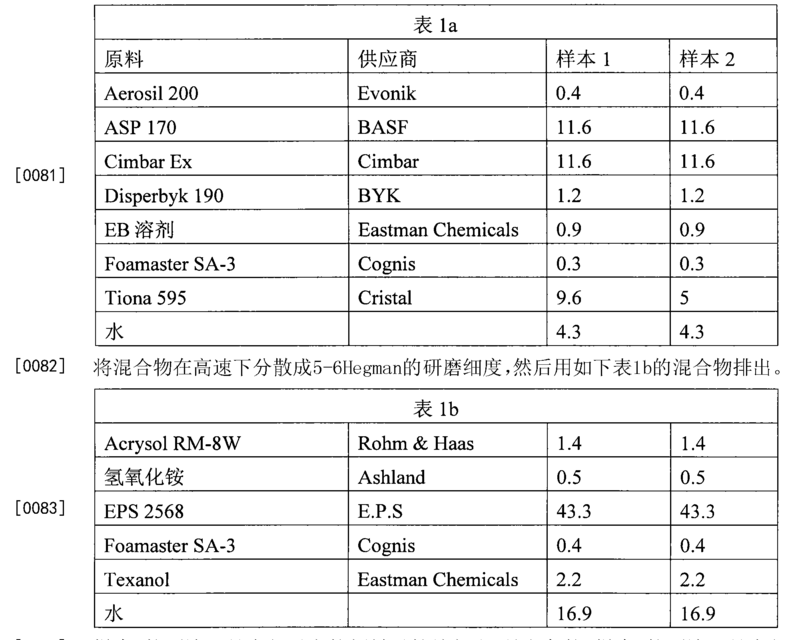 将如下成分加入高速混合容器中。  The following ingredients are added to a high speed mixing vessel. 除非另有声明，所有列出用量都是重量份。 Unless otherwise stated, all amounts are listed in parts by weight. 样本1的顶涂层具有相对高的颜料对粘结剂比，是白色的。 Top coat  Sample 1 has a relatively high pigment to binder ratio, it is white. 样本2的顶涂层具有相对高的颜料对粘结剂比，其中降低的白色颜料的填充量得到较低的遮盖力。 Sample 2 top coat having a relatively high pigment to binder ratio, wherein the decreased filling amount of the white pigment to give a lower hiding power. LUUM」 将泯合物在咼運卜分敢成5-6 Hegman的妍磨细度，然后用如卜表2b的泯合物排出。 LUUM "will obliterate transport compound in 咼 dare to Yan Bu points 5-6 Hegman degree of ground, and then discharged with a compound such as Bu obliterate Table 2b. 在将近使用时，在涂覆涂料之前，将如下表2c的混合物添加到表2a和表2b的混合物中。  When almost used, before application of the coating, the following mixture was added to the mixture in Table 2c Table 2a and Table 2b. 这个实施例中所述的涂料是传统的溶剂基涂料，其在集装箱行业中用作冷藏货物集装箱的富锌底漆上的中间涂层。  The coating in the Examples are conventional solvent-based coating, which is used as an intermediate coating layer on the zinc-rich primer refrigerated cargo container in the container industry. 在本发明的一个实施方式中，该涂料被用于至少在腐蚀保护了的框架上提供防水阻隔。 In one embodiment of the invention, the coating is used to provide a waterproof barrier on the framework at least corrosion protection. 可选地，该材料可以在涂覆本发明的水性顶涂层之前涂覆到整个集装箱上。 Alternatively, the material may be coated prior to the present invention is an aqueous top coat is applied to the entire container. 将混合物在高速下分散成6.5Hegman的研磨细度，然后用如下表3b的混合物排出。  The mixture was dispersed 6.5Hegman fineness of grind at high speed, and then the mixture was discharged in the following table 3b. 将以上实施例中制备的顶涂层组合物的性能测试报告在下表中。  prepared in the above embodiments of the performance testing topcoat composition reported in the following table. 在直接涂覆到不锈钢或涂覆在实施例2的涂料组合物上的任何情况下，实施例1的样本1和样本2二者都表现可接受的涂覆性质，其允许空气在固化前从膜中逸出，而没有过度下垂其他不利涂层缺陷。 In coated directly onto a stainless steel or in any case on the coating composition of Example 2, the embodiment 1 of both the samples and the samples of Example 2 exhibited acceptable application properties, which allow the air before curing film escape without excessive sagging other adverse coating defects. 实施例2涂覆在Corten钢上的金属化锌或锌底漆上，这样能够密封含锌部分，从而允许实施例1的样本1和样本2被成功涂布而没有过度起泡或其他缺陷。 Example 2 embodiment the coated metal or zinc primer on Corten steel, so that the zinc can be sealed portion, thereby allowing the sample 1 and the sample of Example 1 Example 2 was applied successfully without excessive foaming or other defects. 当在不锈钢上涂覆对比例A的含较少颜料的涂料时，观察到不好的涂层外观。 When the coating of Comparative Example A containing less pigment coating on the stainless steel, the poor appearance of the coating was observed. 考虑本说明书或者从本文公开的本发明的实施出发，本发明的其他实施方式对于本领域技术人员来说是明显的。  consideration of this specification or from practice of the invention disclosed herein, other embodiments of the present invention will be apparent to those skilled in the art. 本领域技术人员可以在不脱离权利要求书所要求的本发明的真实范围和精神的前提下对本文所述的原理和实施方式进行各种省略、修改和变化。 Various omissions, modifications and variations of the embodiments described herein the principles and embodiment premise true scope and spirit of the present invention to those skilled in the art may be made without departing from the claims required. 1. 一种涂布货物集装箱的方法，其包括如下步骤： 提供货物集装箱或其一个或多个构件，其中，所述货物集装箱至少基本上符合适用于通过如下系统中的至少一种运输的货物集装箱的国际标准，所述系统是水路运输货物的海运货物系统、铁路运输货物的系统和/或公路运输货物的系统，并且其中所述货物集装箱或其一个或多个构件的暴露表面的至少一部分含有至少一种不锈钢合金； 利用至少一种水性涂料组合物直接地在所述货物集装箱或其一个或多个构件的至少所述暴露的不锈钢表面上形成涂层，其中，所述水性涂料组合物含有如下成分，所述成分包括： 水性载剂； 与所述水性载剂混合的树脂组分，其包含至少一种成膜树脂;和足够量的分散在所述水性涂料组合物中的非粘结剂颗粒，使得由所述组合物制成的干涂层包含，基于所述干涂层中涂料固 A method of coating a cargo container, comprising the steps of: providing a cargo container or one or more members, wherein at least substantially in line with the cargo container cargo by the following applies to at least one of the transport system of Container international standards, the system is a water system of marine cargo transportation of goods, systems and / or systems of railway road transport of goods of goods, and wherein the cargo container or one or more components of at least a portion of the exposed surface forming a coating on a stainless steel surface with at least one aqueous coating composition directly in the cargo container, or at least one or more members of the exposed, wherein said aqueous coating composition; stainless steel alloy comprising at least one containing the following ingredients, said composition comprising: an aqueous carrier; mixing an aqueous carrier with the resin component comprising at least one film-forming resin; and a sufficient amount of the aqueous dispersion of the non-stick coating composition coalescent particles, so that a dry coating made from the composition comprising a coating solids based on the dry coating 的总体积，至少15体积百分比的所述颗粒， 其中，所述至少一种成膜树脂是酸或其盐或其酯官能的，并且由如下成分得到，所述成分包括(a)至少一种含有悬挂的可自由基聚合官能度的芳族反应物；（b)至少一种具有悬挂的酸或其盐或其酯官能度的可自由基聚合反应物；以及(c)至少一种具有可自由基聚合官能度的其他可共聚反应物。 Total volume, at least 15 volume percent of said particles, wherein said at least one film-forming resin is an acid or a salt or ester functions, and obtained by the following ingredients, said ingredients comprising (a) at least one radical containing pendant aromatic functionality polymerization of the reactants; (b) at least one free radically polymerizable reactant suspension having an acid or a salt or ester functionality; and (c) having at least one free radically polymerizable functionality of other copolymerizable reactant. 2. 如权利要求1的方法，其中，所述水性涂料组合物包含10至70重量％的至少一种成膜树脂。 2. A method as claimed in claim 1, wherein said aqueous coating composition comprises at least one film-forming resin 10 to 70% by weight. 3. 如权利要求1的方法，其中，所述水性载剂包含，基于所述载剂的总重，0.3至15重量％ 的共载剂。 3. The method as claimed in claim 1, wherein said aqueous vehicle comprises, based on the total weight of the carrier agent, 0.3 to 15 wt% of co-carrier. 4. 如权利要求1的方法，其中，所述非粘结剂颗粒选自由BaS〇4、CaC〇3、粘土、瓷土、云母、 滑石及其混合物组成的组。 4. The method as claimed in claim 1, wherein said binder particles selected from the group consisting of non BaS〇4, CaC〇3, clay, china clay, mica, talc, and mixtures thereof. 5. 如权利要求1的方法，其中，所述非粘结剂颗粒在相应的干涂层中的颜料体积浓度在从15至85体积％的范围内。 5. The method of claim 1, wherein said non-binder particles pigment volume concentration in the respective dry coating is in the range from 15 to 85% by volume. NO901323A (en) 1989-04-05 1990-10-08 Goodrich Co B F Aqueous polymeric microemulsions with very nice partikkelstoerrelse. IT1317283B1 (en) 2000-04-19 2003-05-27 Gallazzi S P A Film with barrier coating and method of preparation. MXNL06000041A (en) * 2006-06-26 2008-01-07 Fabricas Monterrey Sa De Cv Corrosion-inhibiting coating for metallic substrates and corrosion-resistant article. MX2013003965A (en) 2010-10-20 2013-06-28 Valspar Sourcing Inc Water-based coating system with improved moisture and heat resistance.